This view shows a simulation of how a gas cloud that has been observed approaching the supermassive black hole at the center of the galaxy may break apart over the next few years. The cloud is expected to break up in 2013. This view simulates the expected positions of the stars and gas cloud in 2021. The giant black hole at the heart of our Milky Way galaxy will soon rip apart a vast cloud of gas in a cosmic feast that could reveal just how supermassive black holes gobble their meals, scientists say. The black hole, which contains about 4.3 million times the mass of the sun,is thought to lurk at the heart of the Milky Way. Scientists have named the monster black hole Sagittarius A* and pinpointed its location based on clues from intense radio emissions — matter near a black hole can release extraordinary amounts of light, including radio waves, as it gets super-heated rushing toward the point of no return. Aside from radio waves and some modest X-ray or infrared flares, Sagittarius A* is surprisingly faint, suggesting that activity around it currently is very low, researchers said. This limits what investigators can deduce about its properties and behavior, as well as those of the other supermassive black holes thought to dwell in the cores of virtually all large galaxies. However, since 2002, astronomers gazing through the Very Large Telescope have monitored a dusty gas cloud three times the mass of Earth zip at up to more than 5.2 million mph (8.4 million kph) in a straight line toward Sagittarius A*, putting out five times as much light as the sun as it speeds along. The cloud has now grown increasingly disrupted as it moves closer toward the black hole's accretion zone — the region where matter begins its death spiral into the black hole. "We can actually watch how this cloud gets disrupted — we see the changes in front of our eyes within the few years we have observed the cloud," Gillessen said. "The event will become much more dramatic in the near future ... the cloud now accelerates quickly towards the massive black hole." 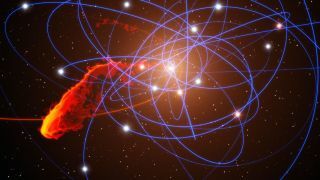 The researchers suggest that monitoring how this cloud behaves in the next few years should help shed light on a number of mysteries surrounding the Milky Way's central black hole, such as its feeding processes. "We can hope to understand how material is distributed around the black hole and thus test theoretical pictures of the emission of Sagittarius A*, which results from the material in the black hole's surroundings," Gillessen said. These images taken over the last decade using the NACO instrument on ESO's Very Large Telescope show the motion of a cloud of gas that is falling towards the supermassive black hole Sagittarius* at the center of the Milky Way. This is the first time ever that the approach of such a doomed cloud to a supermassive black hole has been observed and it is expected to break up completely during 2013. The cloud should reach the black hole in 2012 or 2013. They predict that as the cloud continues to fall into the black hole, its X-ray emissions should become substantially brighter, and it should spit out a giant radiation flare in a few years. "Probably the first telescopes to notice the violence of the event will be X-ray satellites, but later Sagittarius A* might show up in all wavelengths," Gillessen said. The scientists detailed their findings online Dec. 14 in the journal Nature.